Yes, blue wine is officially a trend. You may remember a year ago, I introduced you to the world of Gïk, a Spanish blue wine which caused a bit of commotion with the wine police there. Blue is not an approved wine colour in Spain, so initially it was banned, but after wading through a load of regulations and red tape, it got the go-ahead and was relegated to their 'other alcoholic beverages' category. So technically not a 'wine' in Spain but a wine all the same. Anyway, the Gïk has really hit the fan now as a French entrepreneur, René Le Bail, has launched Vindigo Vin Bleu de Méditerranée on the unsuspecting French market. It's produced at Bodegas Perfer, in Spain's Almería region, because none of his fellow countrymen were happy to be associated with an abomination like blue wine. The good news is, if you're curious about this new arriviste, it is available in Ireland. Fergus O'Halloran, award-winning sommelier and manager at The Twelve Hotel in Barna, Co Galway, was quick off the mark when he tried it on a visit to Rueda, Spain, in January. "They treat it very much as a novelty. And I thought, this is fun and in keeping with what we do in The Twelve. So I arranged to import it along with some other wines from the region," he says. "Nobody knows what it is; it's like a sweet rosé, except it's blue," he explains. "It hasn't gone through a full fermentation, so there's a lot of residual sugar in it. So it's more like something to have before a meal, or as a dessert wine. "A lot of people loved it, but others thought it was a little bit too sweet. So now we serve it in a large gin goblet with ice, a slice of cucumber and a slice of grapefruit. And that kind of cuts through the sweetness of it. It's more like a cocktail, and it's flying out." When he says that the wine is blue, he means seriously blue: it's like the Caribbean liqueur Curaçao. 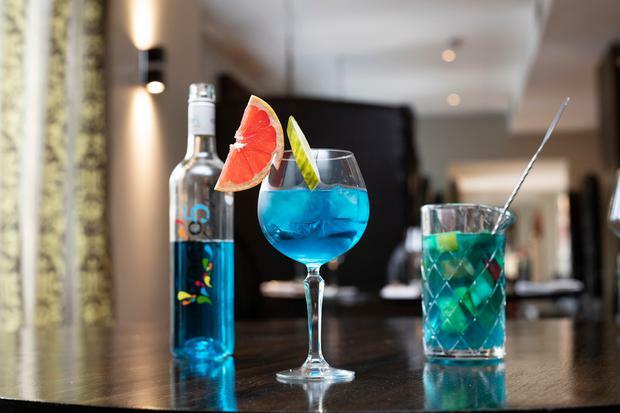 "It's made from grapes that have a particularly high blue pigment in the skin, anthocyanin, so it is blue naturally, but they add a little bit of natural food colouring to create a really funky, nightclubby, neon electric blue. Which makes it look fabulous on the table. It's lovely to have at the end of a meal, and it's also low-alcohol," says Fergus. "We had a Spanish wine dinner and tasting where we launched the blue wine, and I explained that we're passionate about wine here, and to serve a blue wine, some people would say that it's very wrong," he says. "But we got a photo of everyone with a glass of blue wine essentially raising their finger to wine snobbery, because it's wine at the end of the day. And wine is a product that can go off in so many different directions, so why not do a blue wine? It's innovative. "I can certainly see that the French are turning their noses up at it - a lot of people who perhaps have strong beliefs do that. They say, 'That can't be real wine', but it is." If you want to try it, you can opt for The Twelve's Super Sunday package, which includes a bottle of Canto 5 blue wine, dinner at West restaurant, and bed and breakfast from €100 per person sharing. Or you can pick up a bottle at The Twelve, which is in today's line-up, along with a few other unusual bottles of wine. Beautiful Ardtara House in Co Derry will be hosting a French Wine Dinner on September 7, with classic dishes like soupe à l'oignon, salade niçoise, coq au vin, tournedos Rossini and tarte tatin paired with French wines for £79.95pp, or opt for the Wine Dinner, Bed & Break package from £159pp (ardtara.com). In Dublin, the newly opened Dalkey Duck gastropub, formerly McDonagh's, on Dalkey's Castle Street, has some amazing value, with all wines half price all night Tuesday to Thursday, including Champagne, Montrachet and a special selection of Bordeaux wines; and there's a €20 prix fixe menu from 6pm to 8pm (thedalkeyduck.ie). Made from a blend of 80pc Verdejo and 20pc Sauvignon Blanc, this tantalising blue wine is low-alcohol and bright with aniseed, mineral and citrus notes, with shades of apple and tropical fruits leaving a honeyed finish. This is possibly the wine that will please all white wine lovers, as it is a blend of Chardonnay and Sauvignon Blanc. Not what you expect, but it works surprisingly well, with a slight flintiness to the nose and good wet stone minerality with a rich, creamy lemon broadness. A very accessible Georgian orange wine, made from Rkatsiteli grapes which ferment on their skins in a qvevri - a clay vessel which is buried in the ground so that it develops colour and a broader flavour. Silky with flavours of roasted peach skins, a touch of ground almonds and a note of grapefruit pith. A beautiful sparkling wine from Penedès in Spain, made of 100pc Xarel.lo. Fermented with the skins using wild yeasts in terracotta amphorae, it finishes fermenting in the bottle with no sugar or yeast added, giving it a light fizz.